The magic circle is a highly effective piece of pilates apparatus for calisthenics. When used correctly, the magic circle can help shape and firm the muscles of the human body. Pilates is a specific type of body conditioning that includes calisthenics. These calisthenic movements provide opportunities to create length in the body and improve alignment of the spine. The magic circle is a resistance ring of pliable metal that is padded and has handles. It’s a tool to help deepen those calisthenics so that they provide even more results. 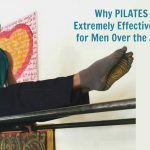 In the realm of exercise systems, Pilates is regarded by most as comparatively safe and therapeutic, and so is often recommended by doctors, exercise physiologists, and physical therapists – particularly for people over the age of 50. What makes the magic circle especially useful is that – as tension is applied to the circle – the circle, in return, provides increased resistance to the muscles. In other words, the harder you squeeze the circle, the harder it squeezes back. Jospeh Pilates, the originator of the exercise method, referred to core muscles as the body’s “powerhouse.” That means that every movement done with the magic circle should, first, originate from the corset of muscles encircling the midsection. If your arms or legs are working but the core is not, then a prime opportunity for conditioning has been lost. 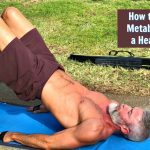 Use that core activation to initiate the calisthenic movement. I encourage you to try the 11 exercises listed below. As you get better at doing this calisthenics, you will need less rest time between exercises. When done consecutively with little or no breaks in between, this series provides not only a strength workout but a cardiovascular-conditioning workout as well. When the workout is complete, your body will feel sculpted – and more specifically you will likely feel that your abdominal and lower back muscles have been deeply conditioned in ways you’ve never experienced before. As always, proceed cautiously when beginning any new movement regimen and consult your doctor first. Hundreds is a pilates staple exercise. No matter what variation of Hundreds you are doing – there are several – it’s usually done toward the beginning of a workout to help increase awareness of the core and raise body heat in that area. The ribcage is like an accordion. It can flare out as it opens or flatten as it closes. This is a key concept that underpins not only pilates calisthenics but most strength-training movements in general. Keep your ribcage compressed, but still breathe dimensionally into all of your lungs. This takes practice! Bolt your lower back into the floor and don’t let it arch off the mat, ever. When you pump your arms, initiate that movement from your lats – your side back muscles. This is not a crunch, so don’t bunch your abdominals up like a punching bag. Contract those muscle fibers, yes – but do it in a way that creates length. If your shoulder blades lift way off the floor, you’re missing the genius of the hundreds exercise. It’s about length, not lift. Imagine laser-beams of energy shooting out the ends of your toes, even though you keep your toes soft. The idea of this visualization is to activate leg muscles while lengthening the spine. It’s called Hundreds because you breathe in for 5 arm pumps, and breathe out for 5 arm pumps. Repeat until you reach 100 repetitions in total, all the while with the magic circle between your legs (just above the ankles). This will also strengthen your inner thigh muscles. Too busy to read the rest of this article now? Save it for later, on Pinterest. Squeeze into the magic circle with the legs, just above your ankles. Roll like a ball, slowly and with control. 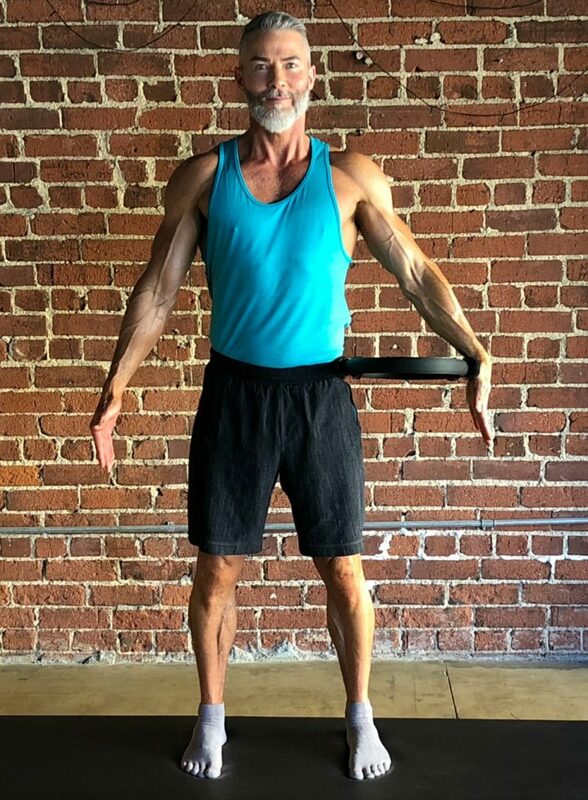 This limbering movement develops agility, balance, activates the body’s stabilizing muscles, and I especially like how it increases awareness of my spine early in the workout. In this exercise, the slower you go, the harder it is. When you return to the top, you’ll be tempted to cheat by letting your feet touch the floor, but the returning position is actually balancing on the edge of your glutes with your feet still off the ground. 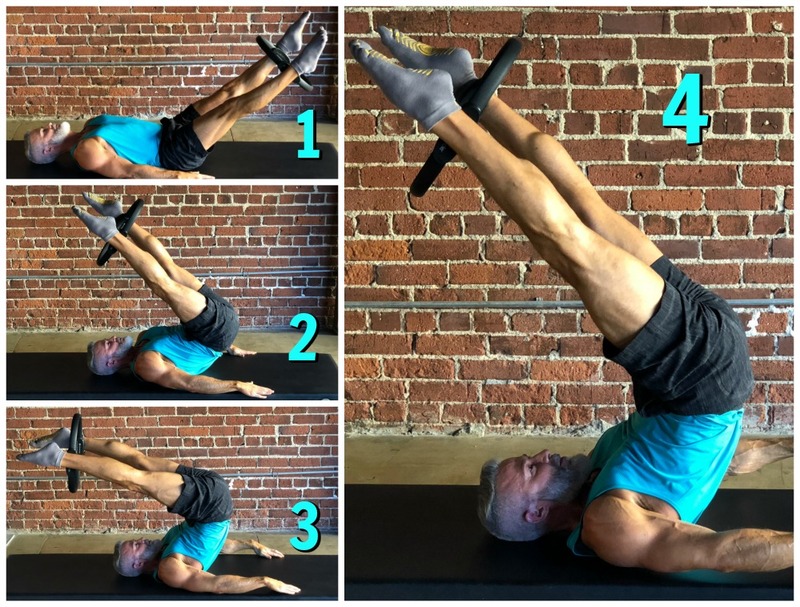 The only way this movement will work properly is if you create a taut C-scoop with your torso, driving your navel back into your spine and hollowing-out your abdomen with intensity. Do this 10x in a row. The brilliance of using a tool such as the magic circle is how it facilitates mind-body awareness – or more specifically, mind-to-muscle. There are workouts I do each week that are focused on lifting the heaviest weights possible and trying to set new P.R.s (personal lifting records). However, any time your objective is to lift the heaviest weights possible, something is lost in the mind to muscle connection. It’s hard to visualize a muscle group or feel a movement from the inside out when you’re just trying to survive hoisting the heaviest load you can. 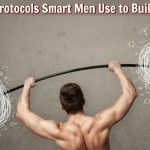 That’s why I intersperse heavy-weight workouts with volume workouts, where my concentration is instead on bone-deep, quality repetitions with exemplary technique. The idea is to create increased definition and work stabilizing muscles instead of just the belly of the major muscle groups. The magic circle is great for this. It helps you to suddenly realize where a movement is really coming from and how best to anchor the right muscle groups to get the right result. Rest one end of the magic circle on the mat between your open legs. Place the stacked palms onto the other end of the circle. Press strongly toward the mat with long fingers. Elevate your torso enough to activate all of your upper abdominal muscles. Then, holding the magic circle between your calves, lower your legs toward the floor – while keeping your lower back bolted to the mat the entire time. Return the legs to above the hips by engaging the lower abdominal plate, not by using your hip flexors or quads. Keeping the magic circle from falling to the floor will force your adductor muscles to step up their game. The adductors are ribbonlike muscles attached along the femur thighbone that help to rotate, flex, and squeeze the thighs together. Potentially, they are among the strongest muscles in the human body, even though we forget to use them enough in modern life. Theoretically, there’s no such thing as spot reducing. So if you want to lose fat deposits around your waist, you need to consume fewer food-calories each day, and, burn more calories each day through physical activity. However, in terms of texture and how fat cells lay on top of muscle cells, fat just seems to look better when stretched over firm muscle. Of course, strong obliques have bio-mechanical advantages beyond just aesthetics. But toned, defined obliques also look nice, and the Criss-Cross exercise really targets them. Squeeze gently as you bring the elbow toward the knee, with the magic circle in between. 5 times each side. 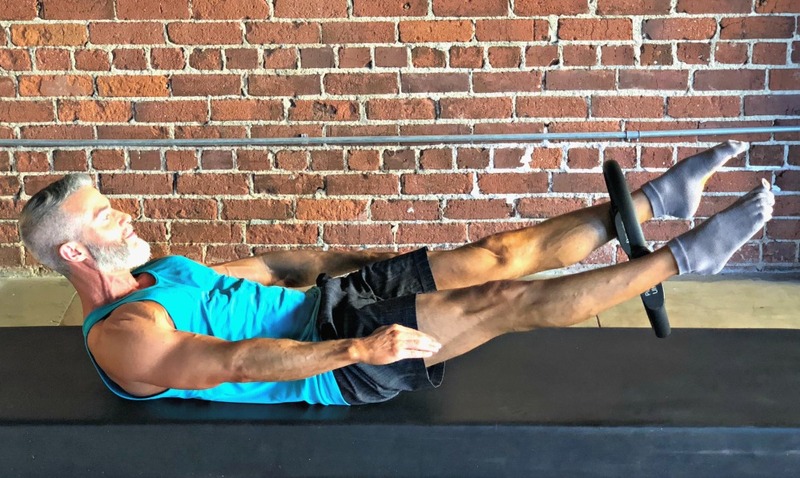 The trick to a good Jackknife, is not to shove the hips up into the air, but rather, to pull the hips into the air by flattening and contracting your lower abdominal plate first. 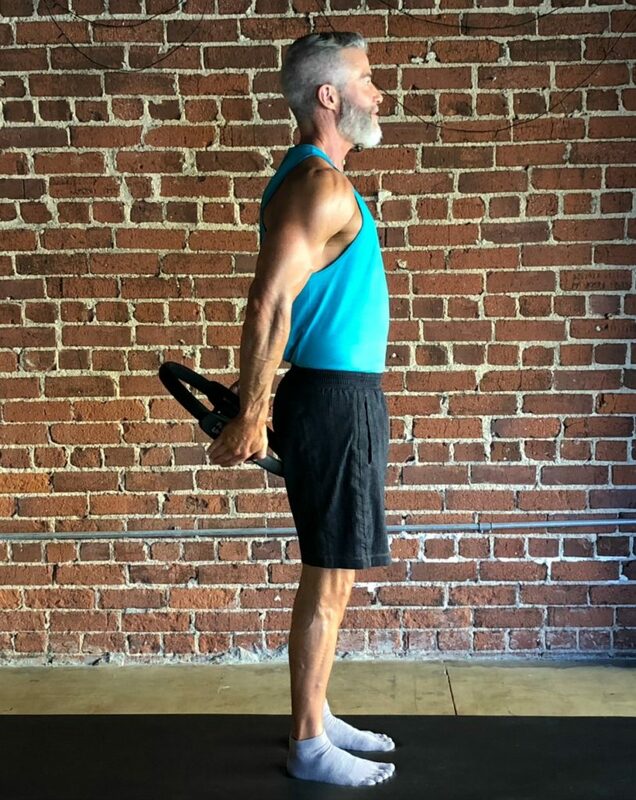 Proceed cautiously (and avoid this calisthenic if you’re having neck issues). Hold the magic circle on the inside of the legs, just above the ankles, squeeze gently and circle the legs 3 times each way. Chest up, but not overextended. Draw your navel in toward your back, and especially, the area just below the navel. Do a can-can pulse gently for every repetition, 5 times on each side. Our gluteal muscles were intended to be very, very strong. Sadly, when we drive, watch tv, sit at a desk, or text, our glutes usually turn to the “off” position. Weak glutes create a lack of support for the body that ultimately puts too much strain on the structure of the spine and the sensitive areas of the lower back. Bridge hips thrusters to the rescue! Not to sound superficial, but let’s face it – we all want a nice-looking caboose. Many pilates calisthenics are designed to lift, firm, and shape the buttocks in a very desirable way. Place the magic circle just above your knees and squeeze gently. As you’re building your bridge pose, really think about your architecture. This one helps to de-hunch your posture by opening the chest and shoulder muscles, while simultaneously strengthening the posterior chain and triceps. Holding magic circle behind back – with long arms, soft elbows, and flat palms – squeeze and release in 10 pulses. Stand as tall as you can. Imagine a string running from the top of your head to the ceiling pulling you up, up, up. Keep your pelvis centered and legs straight, but without locked knees. Place the magic circle at your hip and squeeze and release in 10 pulses. Variation: You can also stand with legs together and turned out at the hips (with feet in a “V” shape), which will engage the inner thighs and gluteals in a different way. One’s fitness journey looks different after the age of 50 than it did in one’s 30s. Where once you wanted “nightclub muscles” to score dates, now the priority is robust health so that you can live a vibrant, productive and joyful life. You want supple joints and strong muscles that support your spine. You want agility, balance, and excellent posture. You want the kind of strength that prevents knees, back, ankle, hip and neck problems. You want to exercise because exercise reduces inflammation and that, in turn, reduces your chances of disease. You want the elevated brain chemistry that comes from regular physical activity. You want a lean, chiseled midsection because you know abdominal fat is associated with a whole host of otherwise avoidable health challenges. You want a spring in your step. Classical Pilates is a method of body conditioning that is uncommonly effective for helping you accomplish all of these things. And the magic circle is one piece of pilates apparatus – simple and relatively inexpensive – that offers undeniable results when used properly. Special thanks to Nigel Sampson of Whole Body Method for his help with the photos and Jeremy Blaine for his help with the video.